Killer Characters: Deck The Halls With Fudge! Deck The Halls With Fudge! Hi all, I'm Frances Devaney and I am a retired school teacher who lives on Mackinac Island, Michigan. Since my retirement, I've been working at the McMurphy Hotel and Fudge Shop as the hotel manager. When the owner Liam McMurphy died this past Spring, his granddaughter Allie moved in and I've spent the last few months helping her have a successful first tourist season. It was during this time that I met and married the love of my life, Douglas Devaney. He and I have finally moved out of my old condo and into our new little house on the island. We both love Mackinac Island in all it's seasons. Now it is the Christmas season and Allie has decided to keep the McMurphy open to a select few tourists. I'm thankful because it helps keep Douglas and I active in the community. The oddest thing happened to me the other day. I was unpacking in the kitchen and looked out the window to see a horse drawn sleigh drive down the road. Suddenly the man inside the sleigh falls out and the sleigh runs him over and keeps going! By the time Douglas and I reach the man, he is dead, the sleigh is gone and the mystery of who would do such a terrible thing begins. Usually, it's Allie who solves a murder mystery but since I witnessed the accident, I feel it's my time to investigate. After all, who knows more about the island and it's residents than a senior citizen who has lived there her whole life? 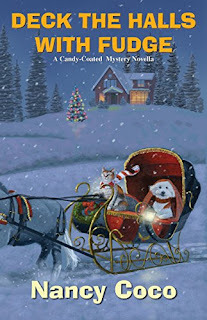 Deck The Halls With Fudge is a promotional e-novella for the Christmas season. Thanksgiving is by far my fave--much hurried and almost forgotten by 34th retail world. It has the best food and recipes. Oh, yes, it is one of my favorites, too! Thanksgiving is the biggie in our house. My wife shares November with her dad, her sister and a couple of the grandkids. We have a full house, including many extended family members who help out by making it a pot luck dinner. I like any holiday that doesn't end up with me having to spend hours in Temple listening to the Rabbi rattle on when I'd rather be home in bed sleeping. Christmas has always been my favorite holiday. I love getting together with family and it brings me joy to give gifts to famiky, friends and those who might not have any coming. We hope to be with family for the holidays...always a fun treat! I hope you get to be with family. I agree, it's the best! It's difficult to choose my favorite holiday since I love Thanksgiving and Christmas for different reasons. My favorite holiday for in general celebrating is Thanksgiving because we get together at my daughter's house and I get to see relatives and friends I haven't seen since the previous Thanksgiving and there's no gift-giving pressure. I love Christmas though because we get together with family at my daughter's house too & the kids have a ball opening their presents while we adults get to hear all about what Santa brought them but they had to leave at home! We have A Christmas Story on television. I love Christmas carols & all the movies with a Christmas theme, especially the versions of A Christmas Carol. And the food---we have about the same thing for Thanksgiving and Christmas except no pumpkin pie for Christmas. For Christmas we have my Mom's chocolate candy which is a home-made fudgy delicious bit of Heaven from her original recipe which starts with eight cups of pecans! Mom passed away in 2013 but her Christmas candy lives on through my daughter who makes it every year for us. Linda, I would love to have this recipe for one of my books- would you share? I would credit you- write me at nancyjparra@yahoo dot com. I love any holiday which allows my family to be together. That's usually Thanksgiving or Hanukkah when we are flexible so my adult children can all be together. Being with family and friends is the best. It's a toss up between Halloween and Christmas. I really like both... Halloween is a fun time of dress up and being in a magical world of make believe (with free candy! ), but the family gets together for Christmas. Christmas has a different sort of magic so I am leaning towards Christmas. No special holidays for us. We are retired and our daughter lives half a country away. Christmas the family gets together.